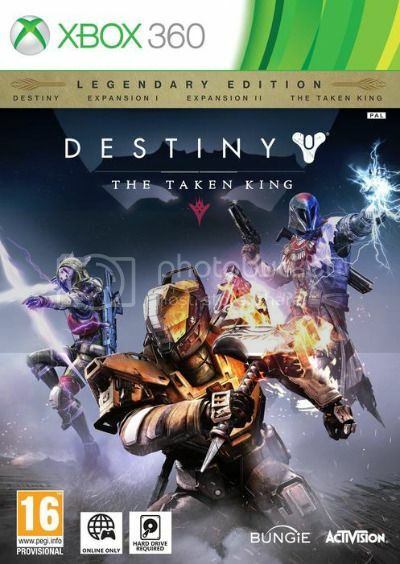 Destiny: The Taken King is the third expansion for the first-person shooter game Destiny, and by far the largest addition to the Destiny universe yet. The Taken King introduces a new story campaign and quests, new enemies to fight, new locations to explore, new Strikes and Crucible maps, a new Raid that will put players to the ultimate test, and more. To stand up to the challenge, players will have access to three new devastating Guardian subclasses, and a massive arsenal of weapons, armor, and gear. Powerful New Abilities – To battle back the Darkness and Taken army, players will get access to brand news subclasses with new supers: Warlocks will now harness the power of an electric storm. Hunters will carve a bow formed from gravitational void energy. Titans will summon a flaming hammer that can sear their adversaries from a range or deliver a devastating melee impact. All-new Campaign – A massive Hive Dreadnaught ship looms in the rings of Saturn. Oryx, The Taken King, has arrived in our solar system, bringing with him a corrupted army to exact revenge on the Guardians who destroyed his son Crota, and to consume our world. New Destination – Establish a beachhead on Oryx’s flagship, the Dreadnaught – a mysterious, loot-filled fortress. New Loot and Customizations – Earn new weapons, armor, and gear, including Legendary, Exotic, Faction and Taken-themed items. Personalize your Guardian even more with The Taken King-themed emblems, armor shaders and player ships. New Competitive Modes: Rift – An objective based mode, Rift, features intense 6v6 action as teams fight for control of the Spark at the center of the map, carry it to the enemy base, and slam it home to detonate the enemy Rift. Mayhem – Bringing a new flavor of gameplay to the Crucible, Mayhem introduces 6v6 team chaos that features significantly faster recharge rate for player abilities, more special/heavy ammo, and faster respawns.